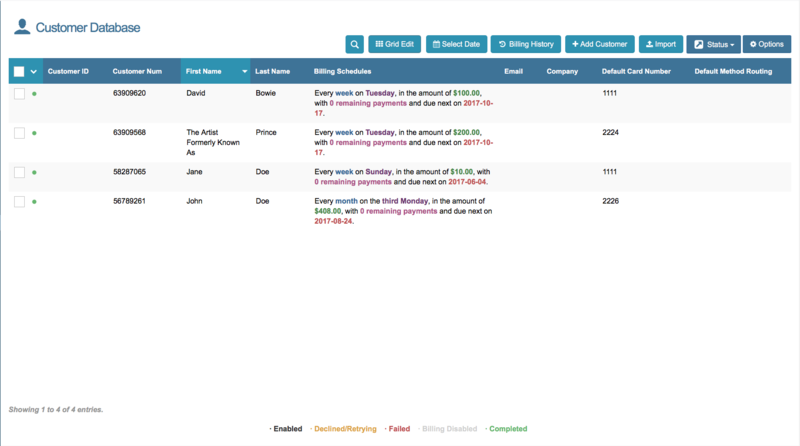 Set up and monitor recurring billing for multiple customers in the Customer Database. Recurring billing customers (active and inactive) and all customers imported to database (from ‘New Order’ tab and from Transaction Detail pages) are stored in the Customer Database. Recurring billing is the ability to bill a customer in specified intervals, including daily, weekly, monthly, or annually. Please Note: Recurring billing can be processed through credit cards, ACH, and gift cards. To have recurring billing enabled, please contact your reseller. To access the Customer Database, click on ‘Customers’ on the side menu bar. By default, the ‘Customer Database’ table arranges customers from newest (most recent customer on record) to oldest (first customer on record). The table can also be rearranged based on the Customer ID, Company name, or Last Name. For example, to rearrange the table by the Customer ID click on ‘Customer ID’ on the top bar of the table. As shown in the image above, the table is now arranged in descending order. Click on ‘Customer ID’ in the top bar again to arrange customers in ascending order. 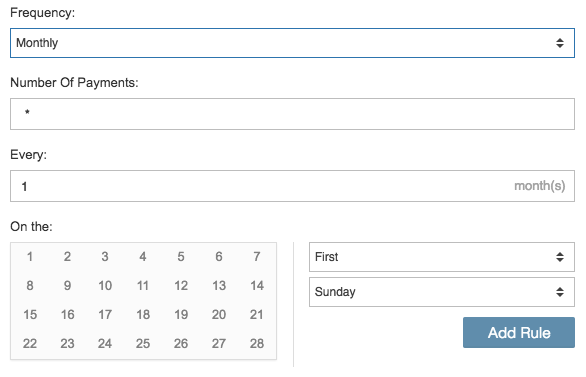 By default, the table displays the Customer ID, Company, Last Name, and Billing Schedule fields. To add or remove customer fields from the table, click 'Options' located at the top right hand side of the page, then click ‘Customize Table’ on the drop down menu. The ‘Table Options’ pop up window will appear showing current and available fields. ‘Current Fields’ are the fields currently showing in the table. ‘Available Fields’ are the fields available to add to the table. To add more columns into the Customer Database table, drag and drop a field button into the ‘Current Field’s’ section. To remove a specific field, click the unwanted field button and drag it to the ‘Available Fields’ section. Once you have finished adding or deleting specific fields, click 'OK'. If you want to reset your Customer Database table to default, click 'Reset Default'. Enabled- Customer is enabled for recurring billing and their credit card or checking account is in good standing. Declined/Retrying- Customer's charge did not go through, or encountered an error, the system will retry for up to three days from the initial transaction allowing enough time to edit and update the customer's payment information. Failed- Customer has been disabled after all re-run attempts declined. Billing Disabled- Customer's recurring billing is disabled when it is NOT due to error, decline, or completing the cycle. Completed- Customer has completed their recurring billing cycle (and either reached the set end date, or total number of transactions to run). 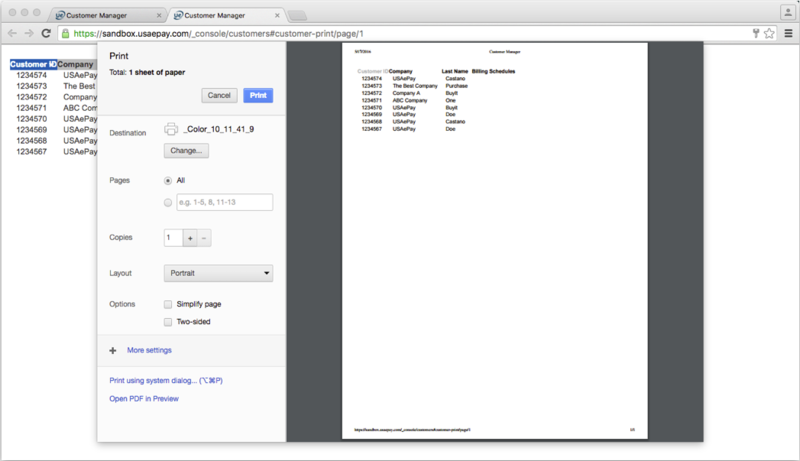 The image below shows an example of a customer database that has been filtered by 'Completed' customers. To add a new customer, click '+Add Customer' located at the top right hand side of the Customer Database page. After clicking, +Add Customer', a pop up window will appear. Enter the customer’s general information on the blank fields. The customer’s First Name and Last Name are required fields. All the other fields are optional. Click 'Apply' to save changes and stay on customer profile. Click 'Save' to save changes and return to the customer database home page. Click 'Cancel' to discard changes and return to the customer database home page. To add a payment method, click the ‘Payment Methods’ tab, then click . 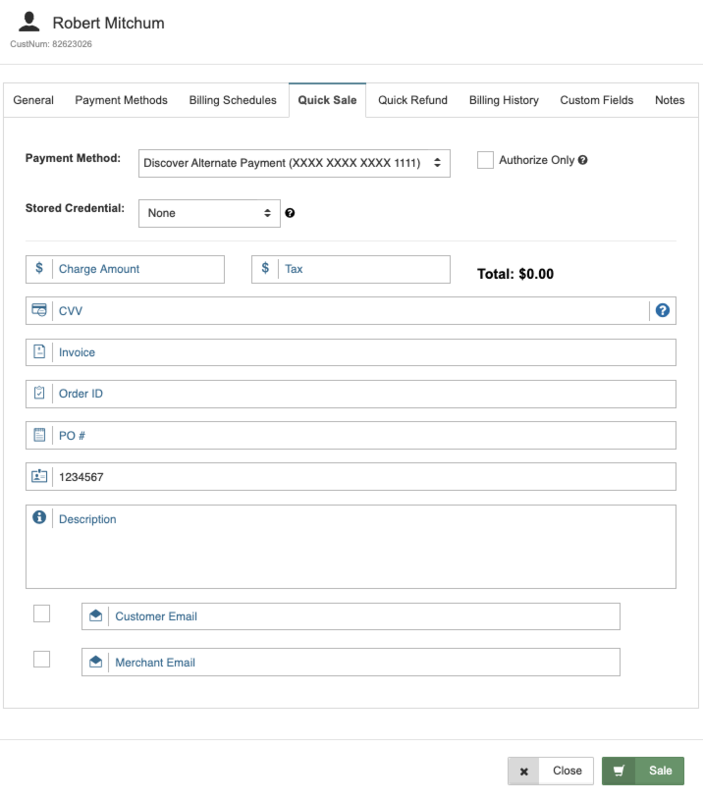 You will only see payment method types you are set up to process. If you would like to add payment method types, call your merchant service provider to set up processing. 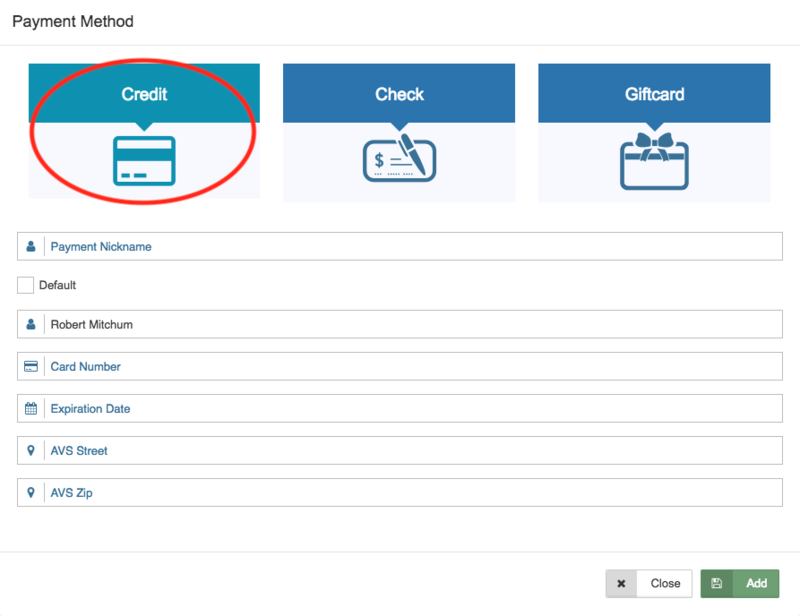 Click the credit tab to set up a customer’s credit card as a payment method. Enter the customer’s card number and the credit card’s expiration date. All the other fields are optional. Please Note: Check the ‘Default’ box, to save the customer’s credit card information as their default recurring billing payment method. Payment Nickname A merchant defined label or the payment method. This is for your reference and does NOT have to be the name on the card. Cardholder Name The name on the credit/debit card. This will auto-populate with the customer's first and last name, but can be changed. This field will appear in the transaction details instead of the customer name. X Card Number Full credit card number. Once entered, this will be masked. X Expiration Date Credit card expiration date. 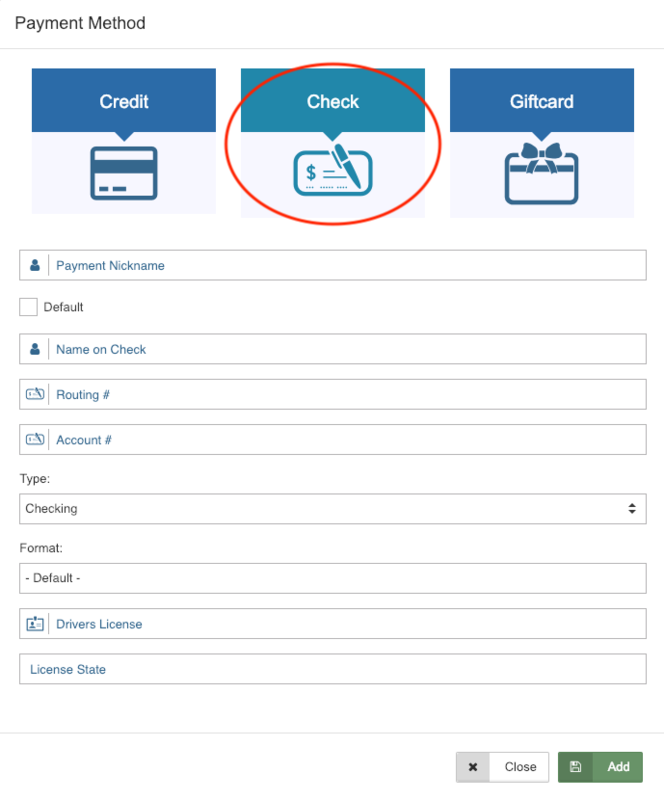 Click the check tab to set to set up a customer’s checking account as a payment method. Enter the customer’s Routing number and Account number. All the other fields are optional. Payment Nickname will be an internal reference for the payment method. The Name on Check field should be the name on the customer's bank account. Please Note: Check the ‘Default’ box, to save the customer’s account information as their default recurring billing payment method. Payment Nickname A merchant defined label or the payment method. This is for your reference and does NOT have to be the name on the bank account. Name on Check The name on the check. This will auto-populate with the customer's first and last name, but can be changed. This field will appear in the transaction details instead of the customer name. X Type Categorizes the customer's bank account as either checking or savings. Drivers License Drivers license number used to verify customer's identity. License State The state that issued the above drivers license (also for identification purposes). 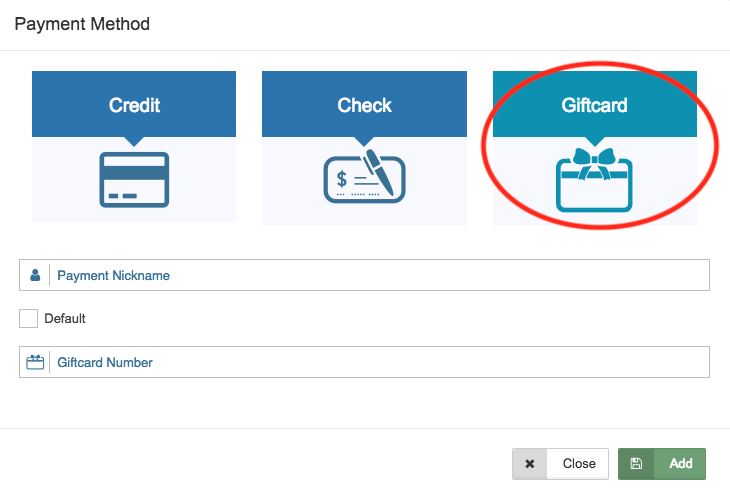 Click the giftcard tab to set up a customer’s gift card as a payment method. Enter the customer’s gift card number. The ‘Payment Name’ field is optional. Please Note: Check the ‘Default’ box, to save the customer’s gift card number as their default recurring billing payment method. Payment Nickname A merchant defined label or the payment method. This is for your reference. X Giftcard Number Customer's giftcard number. Once you are done, click 'Add'. This will take you back to the 'Payment Methods' tab. Before you add a billing schedule, you must click either 'Apply' or 'Save'. Click to save changes and stay on customer profile. Click to save changes and return to the customer database home page. Click to discard changes and return to the customer database home page. Click to add another payment method to this customers profile. Please Note: The ‘Customer Database’ can store more than one payment method for each customer, but only one can be classified as the ‘Default Payment’. To add a billing schedule, click on the ‘Billing Schedules’ tab then click . Order ID Merchant assigned order number, used for your records. User This is automatically set to Auto. The dropdown menu includes all of the users on the account. 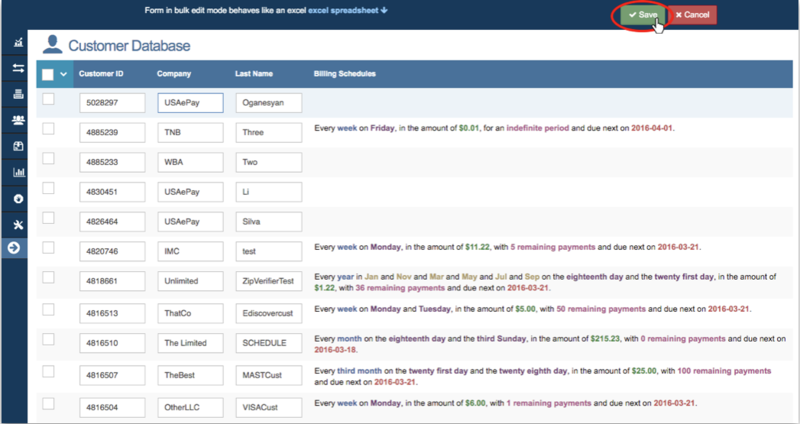 You can use this field to track which user set up each billing schedule. Source Type This is automatically set to Recurring. X Sub Amount Recurring amount before Tax is added. Tax Tax to be added to the Sub Amount. Each Pmt Amt This will be automatically calculated by adding the Sub Amount and Tax. Enabled This box must be checked to enable recurring billing. After entering the payment amount, click on the ‘Schedule’ tab. 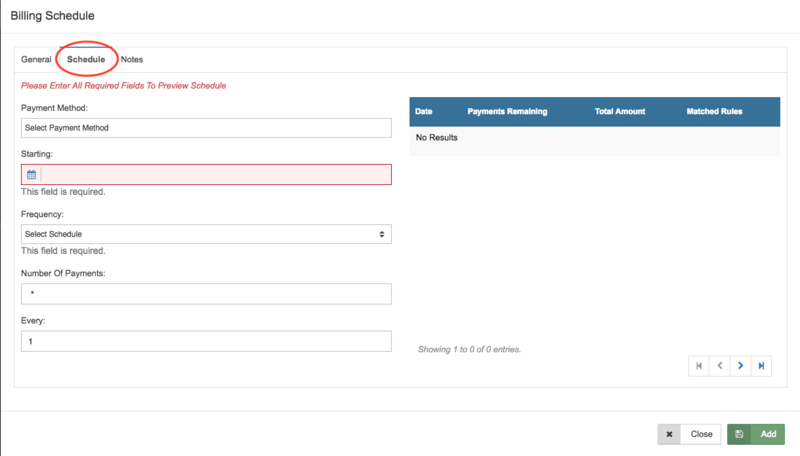 Click the payment method field and select the payment method you would like to charge for this billing schedule. A payment method must be added before setting up the billing schedule. This field is required. 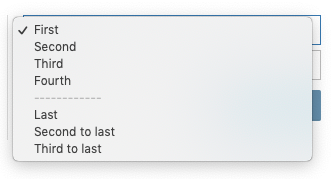 Click the calendar icon, and choose the starting date for the recurring payments. This field is required. Please Note: This is not necessarily the first date the customer will be billed. The first day of billing is the first date that obeys the billing schedule ‘Rules’ on or after the ‘Starting Date’. If you set the starting date to a date prior to the current date, the console will display a warning message like the one below. You must confirm to save the schedule as you entered it. If you do NOT want transactions to be charged once daily until the account is caught up, click "Cancel" and update the date. If you would like the system to charge once daily until the account is caught up, click "Confirm". 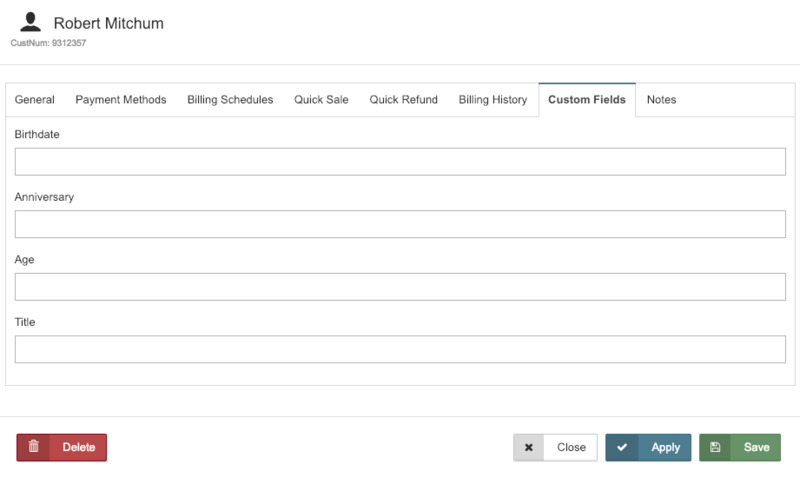 Click the drop down menu and select the desired recurring billing frequency. This field is required. Enter the total number of payments the customer should be charged. If you would like to bill the customer indefinitely, enter a * instead. This field is required. Please Note: The number entered corresponds with the selected ‘Frequency’. 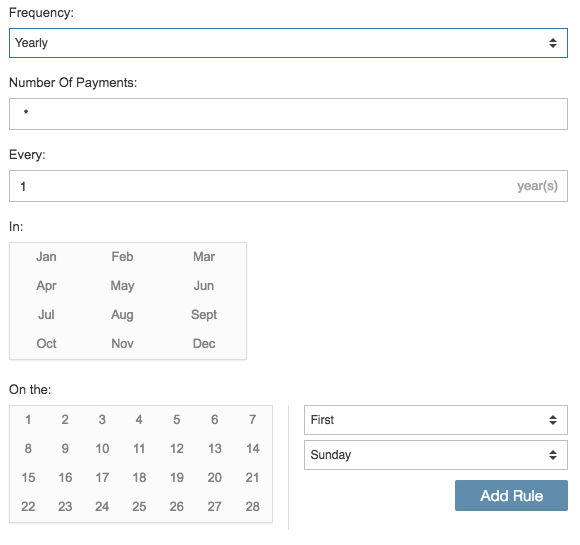 For example, to bill a customer once a month for one year, select ‘Monthly’ in the ‘Frequency’ field and enter ’12' into the ‘Number of Payments’ field. The Every field represents the frequency offset. For example, If you would like to bill the customer monthly, you would enter 1 to bill them every 1 month. If you would like to bill the customer every other month, you would enter 2 so they are billed every 2 months. This field is required. Refer to the image shown below. Once you have entered the Frequency, Number of Payments, and Every for the billing schedule, you will be given the option to enter the rules. Based on the example, the merchant selected ‘Second’ and ‘Monday’ on the customer’s recurring billing schedule. This means that the customer will be charged every second Monday of the month. 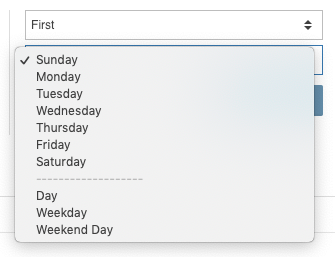 Click 'Add Rule' to apply the recurring billing schedule. You can choose more than one rule per schedule. Click 'Add Rule' to apply the recurring billing schedule. Every Billing Schedule must have a rule applied to it. This can be done in two different ways: - "On the:" Rule: Selecting the specific day(s) of the month to be billed. Once clicked, this will populate the future billing charges table on the right. - Sub-Weekly Rule: This rule has two drop-down settings: the frequency and the day. These settings will not be date specific but will be calendar specific. These will apply for monthly and yearly schedules. - The frequency settings are as follows: First, Second, Third, Fourth, Last, Second to last, Third to last. These will help to determine which week of the month to then look for the day in the next setting. - The day settings are as follows: Sunday through Saturday, and Day(non-specific), Weekday, Weekend Day. This setting tells the frequency which day to charge the customer that month or year. Please Note: The table, on the right hand side of the Billing Schedule pop up window, shows your future recurring billing charges. This table will automatically update when you click 'Add Rule'. This table must be displayed to ensure the schedule has been setup correctly. Below is an example of a customer with the rule set to the ‘Second’ and ‘Monday’ of every month. Click 'Add' once you have set the customer’s recurring billing payments. Once you have saved the billing schedule, you will be taken back to the ‘Billing Schedules’ tab. Click on the ‘Notes’ tab and enter any information you would like to take note of on the customer receipt. Send Customer Receipt: Once this box is checked, a receipt will be sent to the customer's email every time the schedule is run. This can also be set when creating a new customer via the Payment Form. Receipt Message: This places a message in the customer's receipt in the Notes field. Description: This adds a description to the receipt in the Description field. Click to add another billing schedule to this customers profile. This page is intended for making one time charges to any of the customer's payment methods. This does not affect any of the customer's billing schedules. To process a quick sale, you will need to select one of the customer's payment methods from the drop down at the top of the section and enter an amount. When you are done filling out the form, click 'Sale'. The "Authorize Only" checkbox allows you to process an Auth Only transaction. The transaction will not be finalized until it is captured. For more information on this type of transaction, see Auth Only. This will not be displayed when using a check as a payment method. This page is intended for making refunds to any of the customer's payment methods. This does not affect any of the customer's billing schedules. To process a quick refund, you will need to select one of the customer's payment methods from the drop down at the top of the section and enter an amount. When you are done filling out the form, click 'Refund'. This section will keep a record of transactions for the current customer. These transactions can come from multiple sources, including but not limited to the console vterm and recurring sources. The most recent transactions will be at the top of the list. You can view each transaction by clicking in each row. The name displayed for each transaction will be the cardholder name for the payment method used. These fields can be customized to include additional information you would like to have in the customer’s profile. 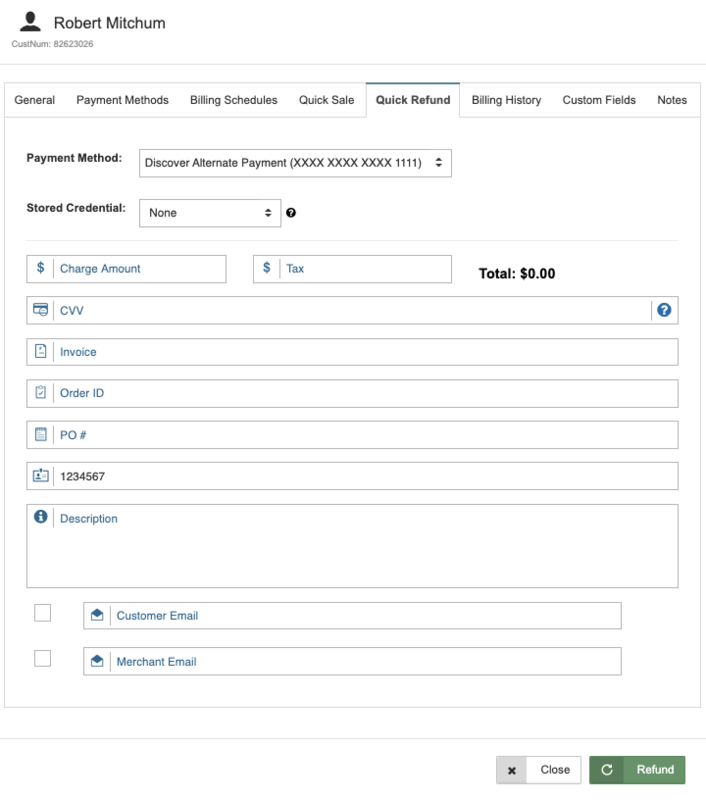 As shown in the image below, the merchant can add the customer’s birthdate, anniversary, age, maiden name, or other information in their billing profile. 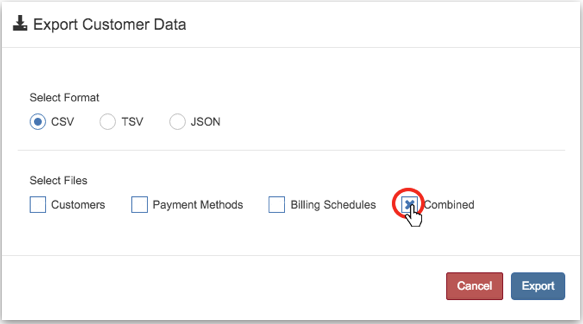 In order to add custom fields in a customer’s billing profile, it must enabled in your Settings. Click on the ‘Notes’ tab and enter any information you would like to take note of. Customers will not see this information. You can search for a customer by name by first clicking the search icon. The search field will then appear. Enter the customer’s name, last name or company name and results matching the criteria will populate. To search a customer by the date of their billing schedule, click 'Select Date'. 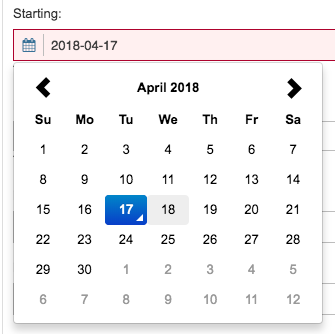 Select the date of the billing schedule you wish to view. 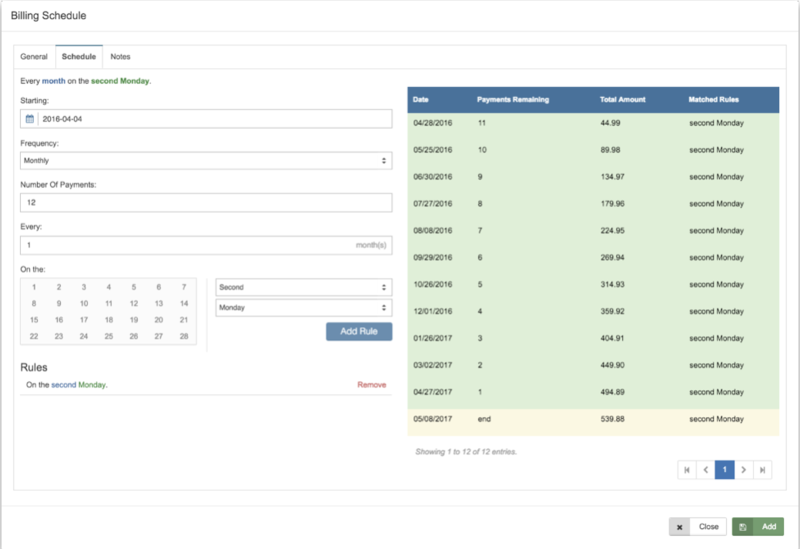 The table will automatically show every customer with the selected recurring billing date. 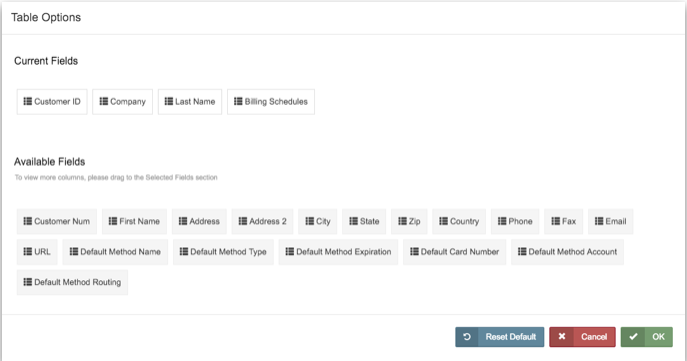 From Customer Database page, click on the customer’s name to view their recurring billing profile. 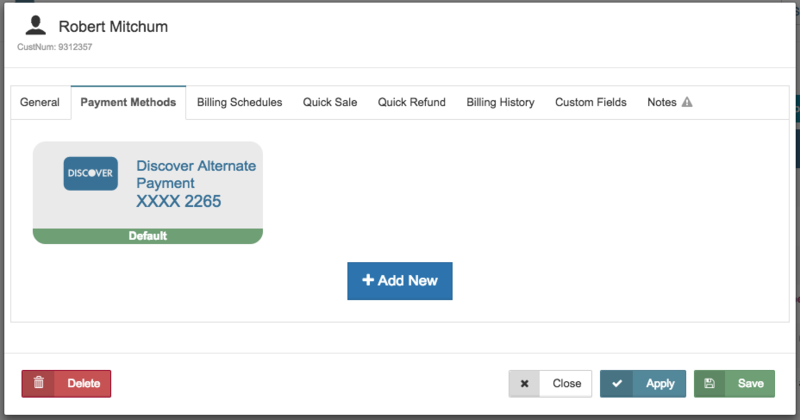 The customer’s profile pop up window will appear, where you can view or edit their General information, Payment Methods, Billing Schedules, Custom Fields, and Notes. See image below. Toggle between tabs and edit any necessary information. Click 'Apply' to save changes and stay on customer profile. Click 'Save' to save changes and return to the customer database home page. Click 'Cancel' to discard changes and return to the customer database home page. Grid Edit allows the merchant to edit all customers at once. Please Note: You can only edit the fields currently displayed in the table. To add or remove columns to the table, see the Customize Table section of this page. 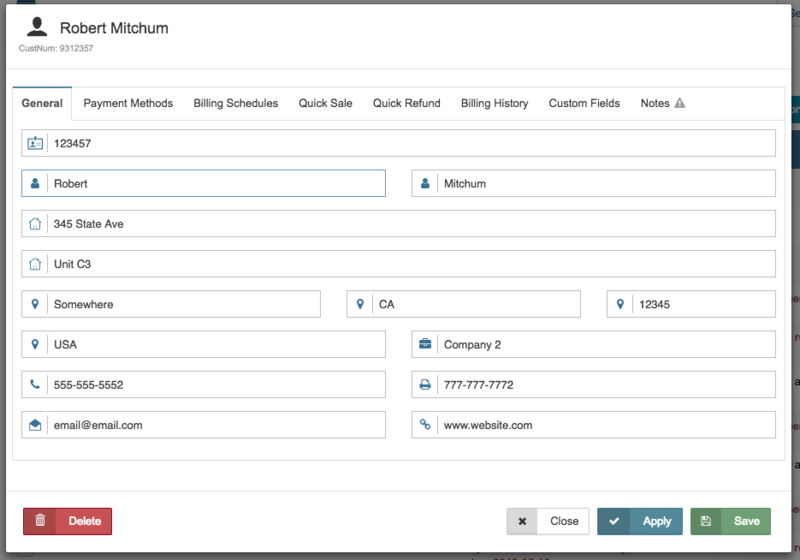 To edit multiple customers’ information at once, click 'Grid Edit'. All information can now be edited. As shown in the image below, the merchant is able to edit the Customer ID, Company name, and Last name for each customer. Please Note: Billing Schedules cannot be edited using Grid Edit. To edit Billing Schedules, see the Billing Schedule section of this page. Once you are done editing all the information, click 'Save' . You will be taken back to your Customer Database homepage. You can enable multiple customers at once, using the arrow next to the checkbox in the upper lefthand corner of the table and then clicking 'Enable Billing Schedule' in the dropdown menu, as shown in the picture below. If any of the customers have a next date in the past, a warning will appear as seen below. "3 of 8 schedule(s) selected have a next date in the past. Enabling these will cause the system to charge the customers daily until the accounts are caught up to the present. If this not what you would like to happen, click on the edit schedules button to update the next date." The console allows you to add or update customer information from a .csv file instead of adding customers one by one. For step-by-step instructions on uploading to the customer database and templates for upload files, click here. To export your customer data, click 'Options' on the top right side of your page then select ‘Export’ from the drop down menu. The Customer Database lets you export your data into CSV, TSV and JSON files. Select the file format you want to export on the pop up window. Under ‘Select Files’, check the box for the information you wish to include in the exported document: Customers, Payment Methods, or Billing Schedules. Check the Combined box to include all information. Click 'Export' and the file will automatically download on your web browser. To print your Customer Database data, click 'Options' then select ‘Print’ from the drop down menu. A PDF print window will pop up on your web browser. Click 'Print' to print your PDF copy. Please Note: The exported, printed, and emailed files will only contain information displayed on the Customer Database page. To add more fields into your files, see the Customize View section of this page.